A combination of high heat and a strong cold front gave way to powerful storms Wednesday. The storms prompted several severe storm warnings Wednesday afternoon and evening and a flash flood warning, but by 5:45 p.m., the storms had started to wane, Storm4 meteorologist Veronica Johnson said. Another round of storms out of West Virginia were heading southeast and were expected to miss D.C. to the south. 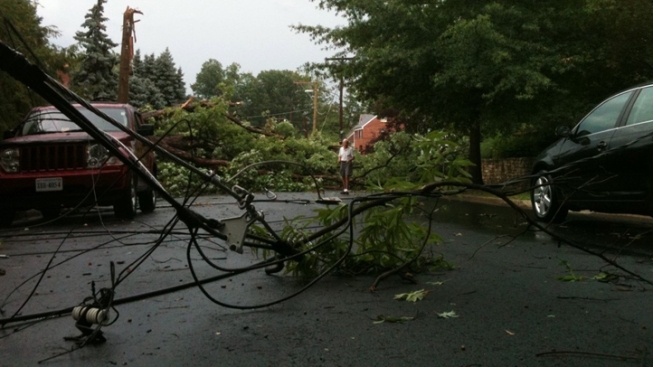 Pepco is reporting 1300 customers don't have power, as storm winds sent trees crashing down over power lines. And a lightning strike even set one house on fire, Shomari Stone reports. The Chesapeake Bay Bridge was closed before 6 p.m. due to high winds. As of 6:30 p.m., the eastbound lanes had reopened, and the westbound lanes were to reopen soon after that. Get the forecast from Storm4 meteorologist Veronica Johnson. There were reports of three-quarter-inch hail, lightning strikes, downed trees and thousands of power outages with the storm system. It also had potential for heavy downpours leading to ponding or flooding on roadways, Johnson said. Rainfall totals of more than an inch have been reported. The National Weather Service called the storms dangerous and advised residents to stay inside away from windows while the storms pass. Meanwhile, the temperature, which reached a high of 101 degrees Wednesday, dropped into the 70s and 80s with the storms. 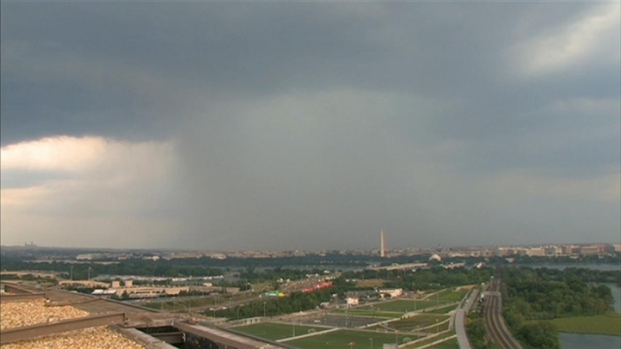 Watch slow-mo video of some impressive lightning strikes in the D.C. area. Another round of cooling storms is expected Thursday afternoon. That could continue into Friday.